宝示戸亮二: piano, toys voice, etc. 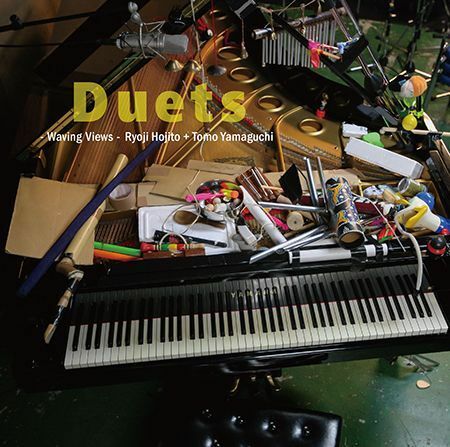 The first duo album by Ryoji Hojito, an improvising pianist, and Tomo Yamaguchi, a junk percussionist. Most of the music is performed complete ad libitum with no rehearsals. A unique pianist expanding its expression using toys, cans, styrofoam, etc. and a rare percussionist who breaths lives into various junk to create his original instruments got together after accumulated experience of their live performances for a purpose of crystallizing this studio album of their improvisation ensemble. Their music can be lyrical, noisy, and sometimes even humorous, to express a colorful space of sounds that represent their sensitive fusion. 07 nature among zashiki-warashi　9'34"
09 kumagera and niwatori are having something to say　4'37"
10 oh sora miyo　6'12"
Ryoji Hojito: piano, toys voice, etc. Tomo Yamaguchi: percussion, voice, etc.